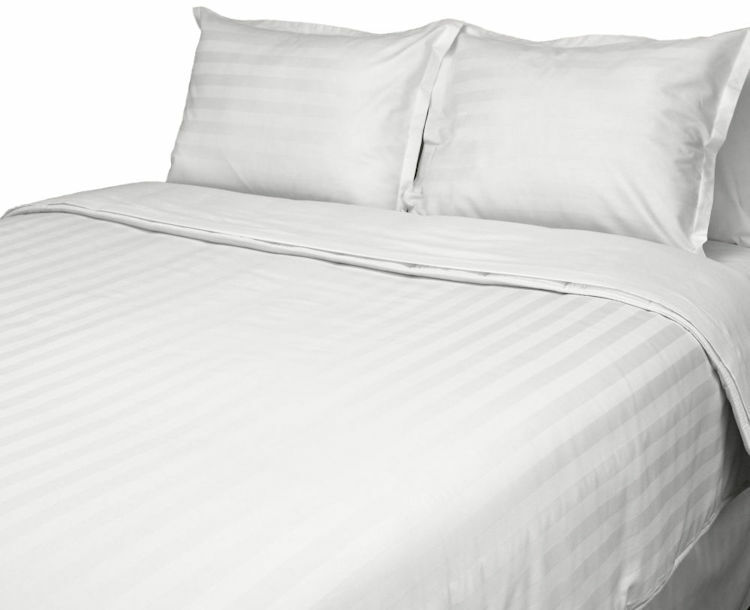 Queen size Eco-Fill T-250 White Dobby Stripe Comforters, a time and cost saving alternative to traditional duvet covers and duvet inserts. Perfect for longer hospitality guest stays or for when you want the look and feel of duvet bedding without the hassle and cost of duvet inserts and duvet covers combined. These Queen Comforters are made using our low-wrinkle, T-250 white dobby stripe duvet cover fabric and our down-alternative Eco-Fill duvet inserts to create 3 layered Comforters that are affordable, long-lasting, easy-care and fast drying. 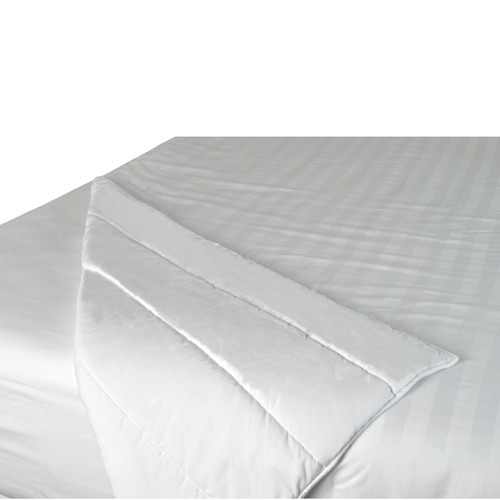 The white dobby stripe fabric is edge sewn onto the top side of the duvet insert to create a smooth top layer that hides the comforter quilting for a duvet bedding look. The quilting is only visible on the bottom side which is the underside of the duvet insert. 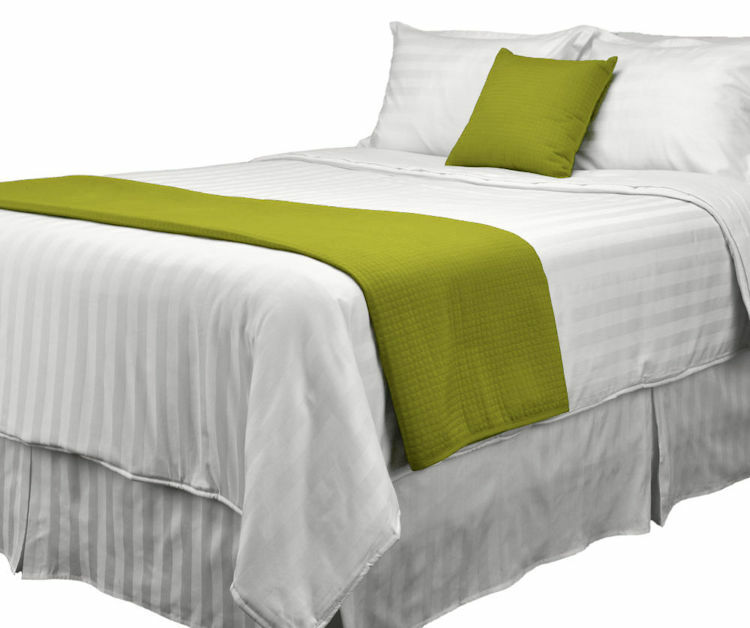 The result is a 3 layer, smooth top 1-piece comforter that looks like a duvet insert with a white stripe duvet cover, but functions like a comforter. Housekeeping teams can get in and out for set ups and turn downs in less time using comforters. The Eco-Fill Comforters are also easy for guest to adjust during their stay, so they are ideal for longer term stays without daily turn downs. An excellent choice for when you need queen bedding with the simplicity and lower cost of a comforter and the look of luxury dobby stripe duvet bedding. 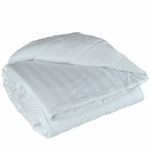 The Queen size Eco-Fill T-250 Covered Duvet Comforters are available wholesale by the case of 3 comforters. Matching T-250 White Dobby Stripe Pillow Shams and Bed Skirts are available separately wholesale by the case to complete the white stripe Comforter Bedding Sets. 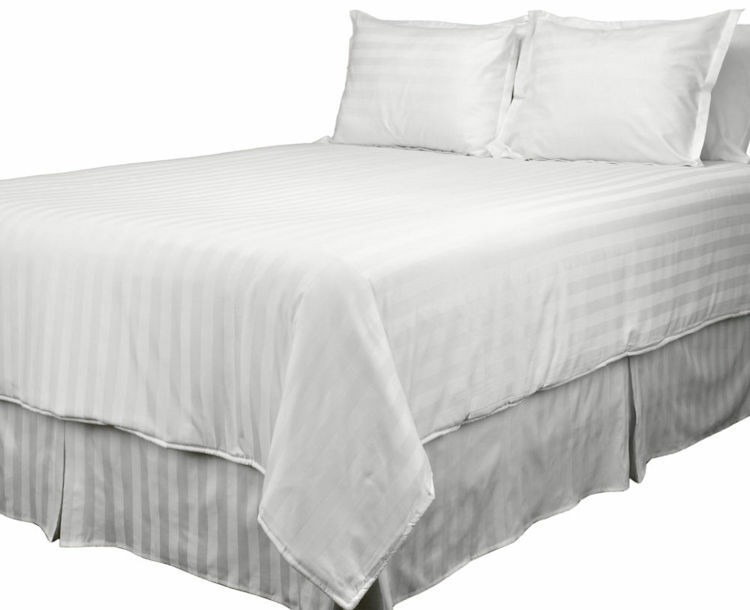 3 Layered White Dobby Stripe Queen Size Comforters - All Season, Hypoallergenic Down-Alternative Bedding. Quick & Easy Set Ups and Turn Downs - 1 piece comforter construction with a Low Wrinkle T-250 White Dobby Stripe Cotton / Polyester Top Cover for fast and easy set ups that look great. Fast drying with No shifting or clumping - 100% Brushed Microfiber Insert is channel quilted with 350 gsm of 100% recycled Polyester Eco-Fill that is reinvigorated when laundered. 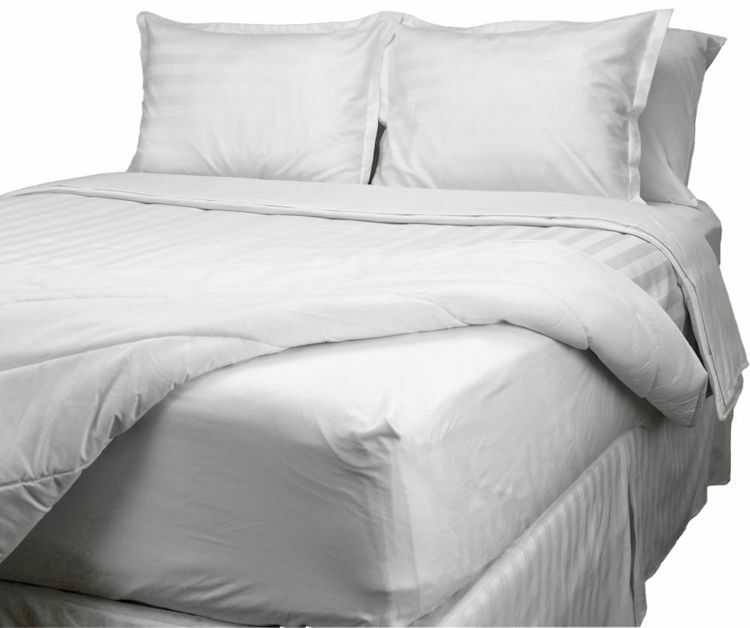 100% Brushed Microfiber provides smooth, Peach Skin Softness on the underside of the comforter. Durable & Fast-Drying - Hospitality quality materials and construction for long-lasting use and to save time and energy in the laundry for fast turns. 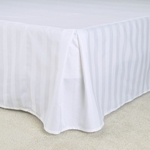 Matching White Dobby Stripe Pillow Shams and Bed Skirts are also available. Tumble Dry on Low - fast drying down-alternative fill becomes reinvigorated when laundered.